Preview Day Three: Further surprises afoot on penultimate day? Shock exits from seeded players has been a common theme so far in Geelong, Victoria and as we prepare to enter the business-end of the tournament could we be set for yet more surprises at the Seamaster 2018 ITTF World Tour Platinum Australia Open on Saturday 28th July? Four quarter-finals ties will be played out on day three of the Men’s Singles event, one of which sees Germany’s Patrick Franziska and China’s Xu Xin meet face-to-face. 14th seed Patrick Franziska heads into the match off the back of a seven game thriller against Sharath Kamal Achanta but can he produce another dramatic display against the master of pen-hold himself? Awaiting the winner of that encounter will be one of Tomokazu Harimoto or Zhou Yu: the two met in the last 16 of the recent 2018 Japan Open in Kitakyushu, a match which Japanese teenage ace Harimoto won in straight games on his way to the title and will be looking for a similar outcome in Geelong. 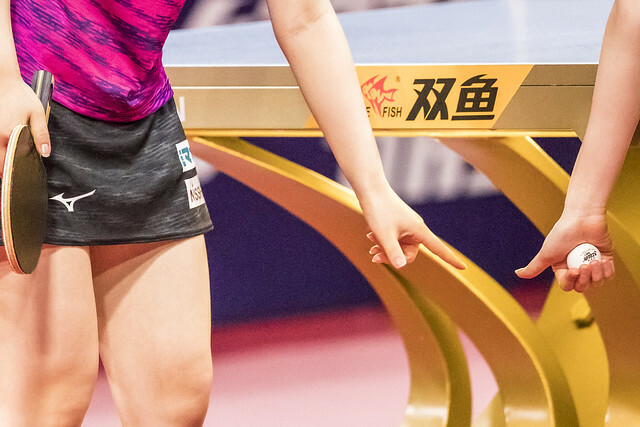 In the top half of the draw China’s Yu Ziyang and Liu Dingshuo will go head-to-head for the first time on the ITTF World Tour while qualifiers Yuya Oshima and Jeoung Youngsik, of Japan and Korea Republic respectively, will play out the other tie in the last eight. Liu Shiwen and Yang Haeun will meet in the first Women’s Singles clash of the day with a spot in the semi-finals up for grabs. Second seed Liu Shiwen is yet to suffer defeat at the hands of the Korean player on the international stage, but could we witness a first in Geelong? World and Olympic Champion Ding Ning will also be seen in action as she prepares to do battle with fourth seed Miu Hirano – expect to see table tennis of the highest calibre when these two take to the table as one of China’s finest players faces one of Japan’s most exciting young stars for a spot in the semi-finals. The first senior trophy of the tournament in Geelong will be presented to Korea Republic with both pairs of Mixed Doubles finalists representing the country. Lee Sangsu and Jeon Jihee will be hoping to live up to expectations as top seeds and lift the trophy but can no.4 seeds Lim Jonghoon and Yang Haeun spring a surprise?